Flossing plays an important role in cleaning the teeth. It gets rid of the foods that are stuck in between the spaces of the teeth to avoid plaque build-up. Plaque build-up, when tolerated, can harden and will be very difficult to remove causing the teeth to appear discolored and stained. This simple negligence of flossing can create bigger problems for dental health such as gum disease, bad breath, and cavities. We at Timber Springs Dental believes that regular brushing and flossing is essential in keeping proper oral hygiene. However, these alone cannot secure a healthy, disease-free mouth and teeth to patients. When these good oral habits are paired with Dental Cleanings & Checkups at Timber Springs Dental, surely patients can be assured excellent dental health. Our team will inform and teach patients the right way of keeping the teeth and gums stay in shape. We also offer prevention and restoration services where patients’ dental conditions are checked, screened to detect potential problems and provide early treatments. Skipping the routine. Most people are guilty of not flossing every day. 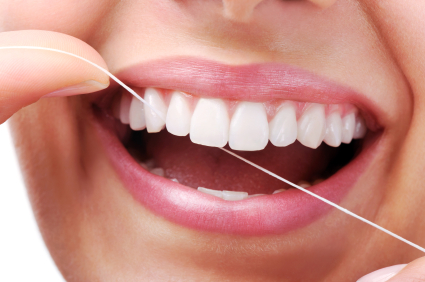 Skipping the routine of flossing will give a space for the plaque to generate bacterias on the mouth and teeth. Before taking floss for granted, think about the consequences of not giving importance to it. Snapping the floss. Too much force can detach the gums from the teeth. Make sure to apply the right pressure to avoid gum recession and gum bleeding. However, it is normal for the gums to bleed during the first time of flossing it. Flossing, when done consistently will get rid of the inflammations. Swapping the floss. Using fingers, paper clips, and other sharp things as a swap for standard floss is a no-no. Aside from getting potential bacterias from these things, it is also ineffective in removing stubborn food debris. One should floss nothing but a piece of floss. Practicing the right flossing techniques don’t just keep the teeth healthy - maintaining good oral hygiene contributes to the body’s health too! You deserve outstanding dental care services. We provide Dental Cleanings and Checkups in Humble, TX. Book your appointment with us at Timber Springs Dental and let us help you achieve a beautiful and a healthy teeth! We are located at 5444 Atascocita Rd., Suite 100 Humble, TX 77346.